The Maroochy Bushland Botanic Garden comprises 82 hectares of lush forested areas and is located off Tanawha Tourist Drive. The gardens are a place of natural beauty, where visitors can come for a peaceful stroll and relax as they walk through the fern gullies and past the on-site lagoon. The gardens are open every day and admission is free. There is a range of picnic facilities available for visitors who would like to stop and have a picnic on the grass under the trees. There are no BBQ facilities available, but visitors are welcome to bring their own portable BBQ or cooktop. There are stroller and wheelchair access to most of the gardens, as well as a number of walking tracks. If you would like to learn more about the plants within the garden, then meet one of the volunteer guides at the Arts & Ecology Centre at 9am for a leisurely hour’s walk and talk. These tours occur on Tuesdays and the 1st and 3rd Wednesdays of each month (Feb-Nov). During the hot months, why not take advantage of the shady, cool areas of the gardens, including the Mossy Log area, the Fern Glade, the Friendship Colonnade and the Ephemeral Wetlands. Come and sit and read a book or enjoy a picnic lunch. Upland Bushwalk: 2km along natural bush tracks with creek crossings and some steep slopes. Lagoon walk: 900m rough bush track, some steps, slippery when wet. Creek walk: 1300m rough bush track, slippery when wet. Sculpture Garden Walk: 900m stroll, mostly wheelchair/stroller accessible, well-developed tracks. Fern Glade Walk: 900m concrete path, some steep inclines. Mossy Log Walk: 110m short 10-minute stroll, softfall track surface, flat, easy walk. 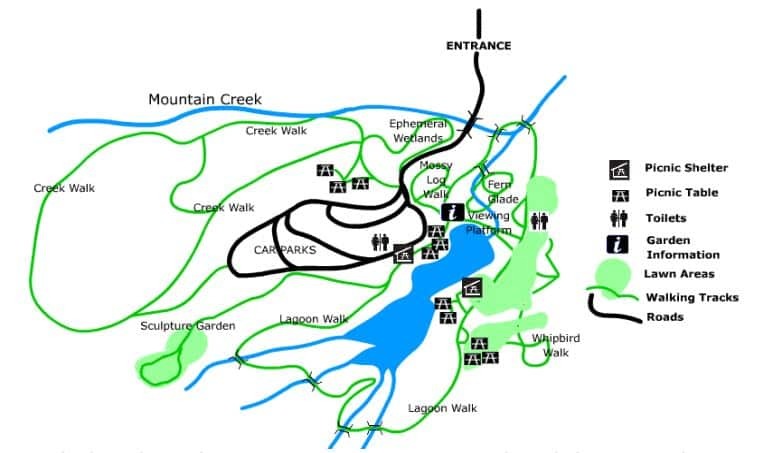 Whipbird Walk: 700m natural rough track, easy walking, 30 minutes. Ephemeral Wetlands Walk: 400m formed track with some natural, rough sections. Dogs and other domestic animals are not permitted in the gardens and there are no rubbish bins, so visitors are requested to take their rubbish with them when they leave. Can we play a friendly game of croquet there? I am not aware of any restrictions about playing casual games in the garden. If you are however creating a larger event with a number of people, just check with the gardens about whether you require a permit here. Hi, are we able to use the garden s for our wedding photos? Yes, weddings are regularly held at the gardens, so I see no impediment to you having photos taken there. Check out this link which provides heaps of information about hosting events at the Maroochy Bushland Botanic Gardens. Can you bring your dog for a walk on leash? Unfortunately, no. No pets or domestic animals are allowed. Yes, there is a small cafe selling coffee and cake, but I believe it is manned by volunteers and therefore not always open. Might be best to take your own picnic if you will be spending a few hours. I’m just checking the the Maroochy botanic gardens are open on Christmas Day? We are planning a small brunch in the gardens. The gardens are open 365 days per year.